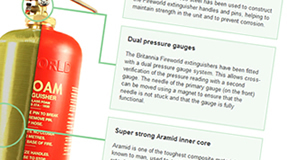 Fire extinguishers are an integral part of the fire safety provisions within any building and as with any product with moving parts their components can start to degrade oer time. To ensure that fire extinguishers are in good working order when they are need it is importantd that they are serviced anualy in accordnace with the BS 5306-3:2009. Why is Extinguisher Servicing Important? P50 service free extinguishers, designed and manufactured by long established Britannia Fire in Norwich, require no service, other than an annual visual inspection which can be carried out by any "responsible person" without the need for specialist training. The the extinguishers are kitemarked to EN3 standard, CE marked and have a 10 year warranty.